FlipKart Cashless PayDay – Get 10% Instant discount on All Bank Debit/Credit cards or Netbanking. 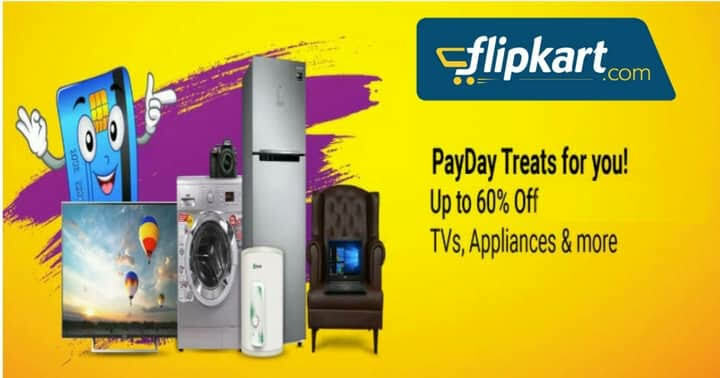 Flipkart PayDay Offer is Here, Get additional 10% Discount through any Bank Debit/Credit Card/Netbanking on Selected categories and More. The Minimum purchase and Maximum discount is depend on Category wise. This Offer is valid from 1st February to 2nd February 2019. So Hurry up and avail this offer Now !! 7) Pay the amount using any bank Debit/Credit cards or Netbanking. Upon fulfilling the above requirements, You will get an instant discount of 10% (Maximum discount of INR 1000) on the total amount spent or the amount paid by Card (in case of partial payment or partial cancellations made as per the T&Cs) in each of the applicable categories subject to a maximum discount under such category as per Table A (“Offer”). 10% Instant Discount with All Debit Cards, Credit Cards, NetBanking & EMI on purchase of products (refer to Table A). 1st Feb 2019 00:00 to 2nd Feb 2019 23:59.